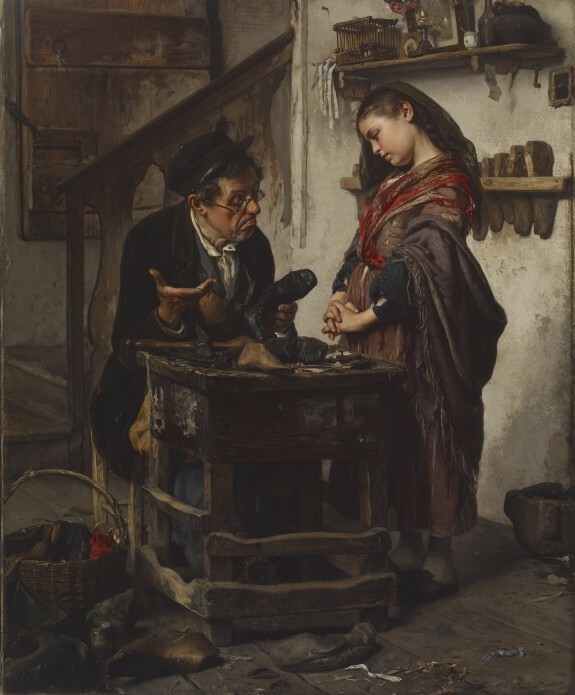 Description A young girl wearing a typical Venetian shawl listens stoically as the shoemaker reports upon the hopeless condition of her boot. The artist has depicted this cluttered interior with characteristic detail. Rotta was born in Italy, and attended to Academy of Fine Arts of Venice in 1828. He showed work in the Exposition of Fine Arts in Milan in 1853, and won a medal in 1878 at the Exhibition of the Salon of Paris. He often painted tender scenes, including children or the elderly. A Baltimorean in Paris: George A. Lucas, 1860-1909. The Walters Art Gallery, Baltimore. 1979. Provenance Anton Ritter von Oelzelt Sale, Vienna, November 18, 1878, no. 64 [as "Niente da Fare"]; William T. Walters, Baltimore, 1878, by purchase [Geroge A. Lucas as agent]; Henry Walters, Baltimore, 1894, by inheritance; Walters Art Museum, 1931, by bequest.